Ah, macarons, macarons, macarons...and macaroons. Not the same thing. Here's a PopSugar article explaining the difference, which was undoubtedly inspired by ignorant blog posts such as this one, written by uninformed foodie-hack blogger types. And now that we know how to differentiate the two kinds of cookies, let's take a look at TJ's latest offering in the macaron—with one "o"—category. If nothing else, the actual product looks like it does on the packaging. There's an attractive, well-formed flaky pastry with a soft, fluffy center. Plus, the molten part is really kinda fun. While peering into your microwave, you can actually see the pastry's gooey center liquefy and slide down the sides of the product just like a middle school science fair volcano. The only problem with that is, you have to time it right. The box suggests 40 seconds. Our microwave is a little on the old and feeble side, so it took about ten seconds longer. Leave it in too long, and too much of the center winds up sliding down onto your plate; not long enough, and there's nothing "molten" at all. But if you stand there and stare at the product, it comes out pretty well if you yank the microwave door open just as the filling starts to ooze. And even I have the attention span to stand and stare at something for 50 seconds or so. The texture of the cookie part of the macaron was a bit stiff and crust-like. 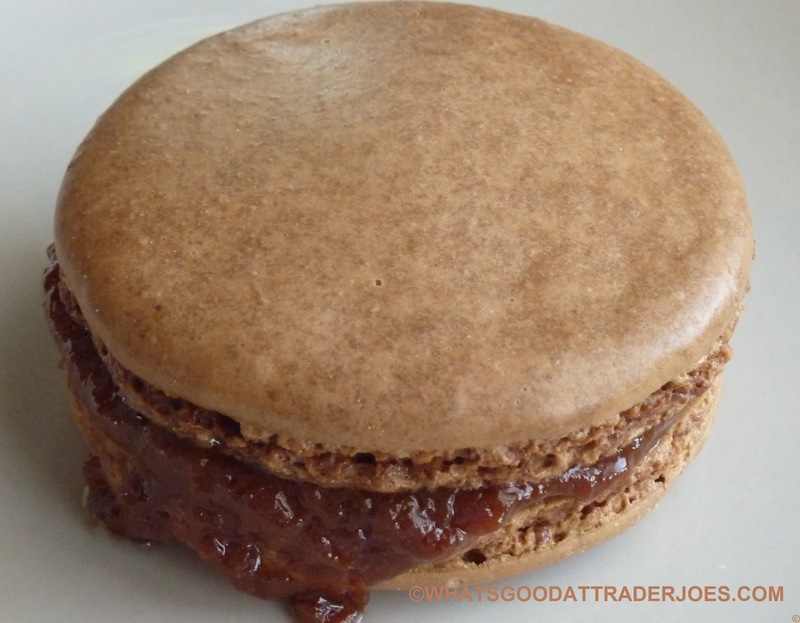 It wasn't altogether unpleasant, but also certainly not the finest example of macaron texture we've seen from Trader Joe's. The filling was more like the creamy center of a toasted marshmallow, and when eaten with the outer shell, helped to compensate for the comparative dryness of the other component. Flavor-wise, the butterscotch version was a run-of-the-mill salted caramel kind of vibe, with an emphasis on the sweetness—just a hint of saltiness. And it wasn't a particularly complex flavor, either. To be honest, I'd be slightly disappointed if I were served this dessert in a restaurant. But there's usually some taste sacrificed in a product that goes from frozen to ready-to-eat in less than a minute. Sonia liked the flavor of this butterscotch one more than the chocolate variety since the butterscotch filling reminded her of cajeta, a Mexican caramel made with goat's milk. 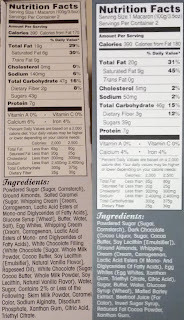 As for the chocolate variety, the texture was identical to that of the butterscotch, as far as I could tell. I liked the flavor slightly more in this case, as it was very similar to a brownie. Sonia wasn't as impressed. In the end, she'd just rather eat a brownie. Apparently Russ and Sandy were not fond of these cookies at all. I don't really blame them. I certainly wasn't as blown away by them as I thought I would be, but as they are, I think I'll score them somewhere in the "not bad" range. Let's go with three and a half for the chocolate version and three for the butterscotch from me. Sonia will throw out three stars for the chocolate version and a four for the butterscotch. 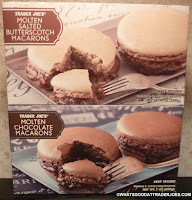 Trader Joe's Molten Chocolate Macarons: 6.5 out of 10. Trader Joe's Molten Salted Butterscotch Macarons: 7 out of 10. I thought it was not too bad. But it was too huge!!! I ate half warm and half frozen. The frozen was better. It makes a good mix-in for ice cream. Yeah Sonia said she actually liked them better room temp/cold, but I didn't think to try them frozen! 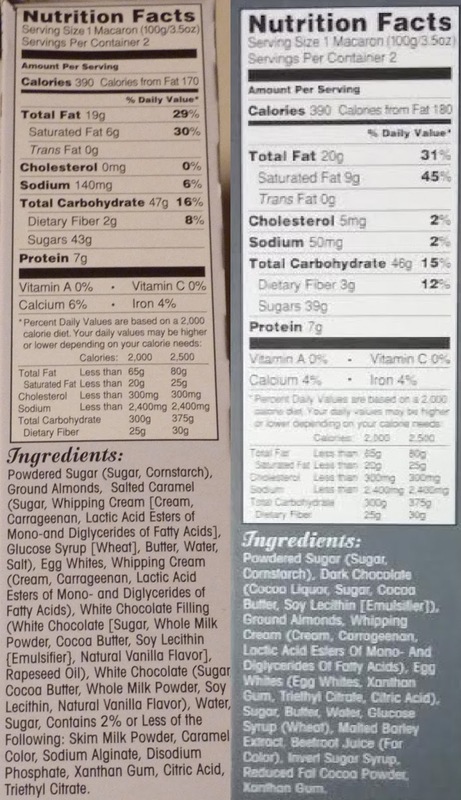 Holy cow I just looked at the sugar content. Each one has approximately 10 - 11 teaspoons of sugar! Doesn't sound like they're worth it. Yep that's a lot of sugar for something that's just "not bad." aren't really designed to be heated. They shouldn't try to completely revamp a classic.